When first introduced, the cross-ratio (CR) based remote eye tracking method offered many attractive features for natural human gaze-based interaction, such as simple camera setup, no user calibration, and invariance to head motion. However, due to many simplification assumptions, current CR-based methods are still sensitive to head movements. In this paper, we revisit the CR-based method and introduce two new extensions to improve the robustness of the method to head motion. The first method dynamically compensates for scale changes in the corneal reflection pattern, and the second method estimates true coplanar eye features so that the cross-ratio can be applied. We present real-time implementations of both systems, and compare the performance of these new methods using simulations and user experiments. 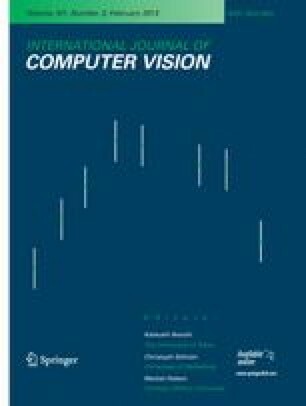 Our results show a significant improvement in robustness to head motion and, for the user experiments in particular, an average reduction of up to 40 % in gaze estimation error was observed. The authors would like to thank Coordenação de Aperfeiçoamento de Pessoal de Nível Superior (CAPES), Fundação de Amparo à Pesquisa do Estado de São Paulo (FAPESP) and IBM for their financial support.